" Greetings of Love and Light "
" Practice Diligently, Purify Yourself and Spread the Teachings. "- MCKS. This is Master's message for all of us. In this view, we announce the workshop Dates that are scheduled for 2018. Trainer : "Mrs. Padmini Ramesh"
Interested souls can call to register: 044 26213528 OR 9282103020. Basic Workshop by Mrs. Sheetal Khemka followed by Advanced and Psychotherapy Workshop. Tamil Basic Workshop by Dr. C.D. Suganthi followed by Advanced and Psychotherapy Workshop. Basic Workshop by Mrs. Neethu Muralidhar followed by Advanced and Psychotherapy Workshop. DON'T PANIC USE " PRANIC "
It was Master Choa's vision to empower people. Empowerment isn't just about "theoretical knowledge" or "learning a healing technique". Empowerment comes about when we begin to apply the priceless teachings of Master Choa to bring about magic in our lives. Life is meant to be abundant in every aspect, and it will be - once we begin to whole-heartedly apply these teachings in our lives. Keeping this in mind, we are pleased to announce weekly nurturing sessions to be conducted by Mrs. Padmini Ramesh. Nurturing sessions take you one step beyond the healing courses. During the nurturing sessions, we pin down very specific problematic areas in your life and show you how to dissolve them using Pranic Healing. With 20+ years of experience in Pranic Healing, Padmini has developed her own repertoire of techniques to ‘heal away’ any problematic area in your life – be it physical and emotional suffering, relationships, stress or finances. Must have completed Pranic Psychotherapy (Doctor and nurses are exempt). Medical Course on basic topic - Anatomy, Physiology and Pathology. Please download the Associate Pranic Healer-Confidential Healing Data form for patients testimonials. 5 : A formal letter to the local foundation stating their interest and plan to propagate MCKS Pranic Healing in the State must be submitted. Mobile : 26213528 / 9282103020 Call for Details. Everyday detail is as follows. 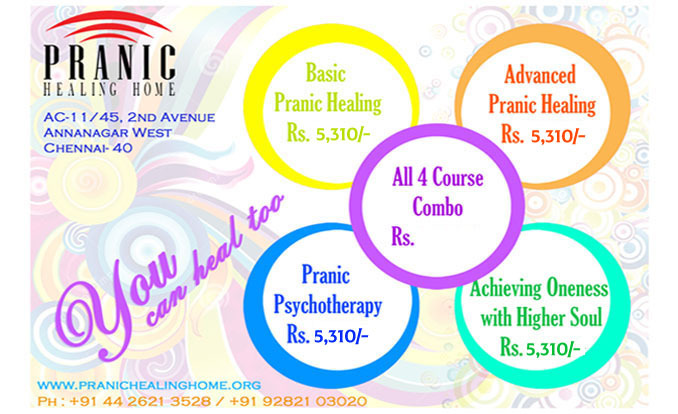 We invite everyone to participate in the full moon meditation which is conducted once a month at Pranic Healing Home. We encourage pranic healers to have the commitment to attend every month without fail. One can come or bring a loved one to experience healing. You can also come to practice/volunteer and offer your services as it is one of the 5 pillars in the teachings of GrandMaster Choa Kok Sui's Arhatic Yoga.